Unique Adventure along Canada’s most northerly highway: Dempster Highway into the arctic tundra! This trip combines birding and easy hiking which makes it unique in its nature. We will spend our days exploring the area from the road and on easy to moderate trails. This gives us great opportunities to observe a wide variety of migratory and resident birds. We will also have time to look for spring flowers of which many are only found in this part of the world. Birder’s highlights are Northern Wheatear, Surfbird, Rock Ptarmigan, Long-tailed Jaeger, Short-eared Owl, Red-throated Loon, and Wandering Tattler. Your guide will identify and interpret the flora and fauna of the area as well as the physical features of the region. This program is tailored to the bird lover and naturalist who likes to venture off the road to take advantage of observations in the solitude away from the highway. Hikes will be up to 4 hours, but always in consensus with the participants. Changes to the itinerary due to weather or road conditions must be considered. Day 1: Individual arrival in Whitehorse. We meet you at your hotel for the trip preparation. Time permitting we go out bird watching to a local hotspot. Day 2: We drive north on the Klondike Highway. Along the way we stop at several lakes to observe water fowl. Short before Dawson City we turn on to the Dempster Highway. In the evening we arrive at the Tombstone Territorial Park Campground, where we will pitch our tents and prepare dinner together. Day 3: We explore the area and hike up a mountain from where we enjoy a breathtaking view towards Tombstone Mountains. 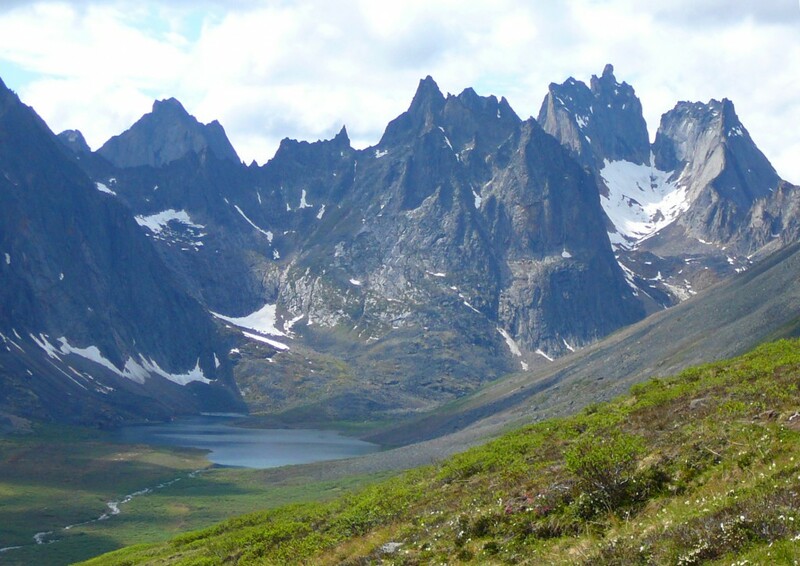 The Tombstones and the Dempster region are well known for their great hiking opportunities. Most of the trails start already above the tree line and give easy access to the tundra and alpine regions. 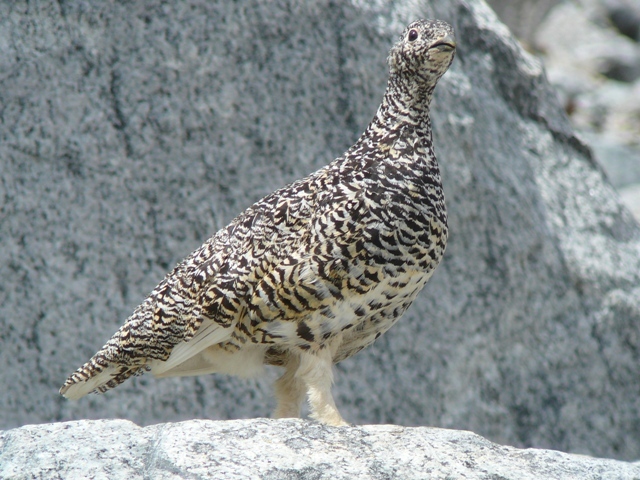 Here we will observe birds of the alpine such as Rock Ptarmigan, Surfbird and Northern Wheatear. Bring your hiking boots and your rain gear. Day 4: Today we drive farther north on the Dempster Highway. 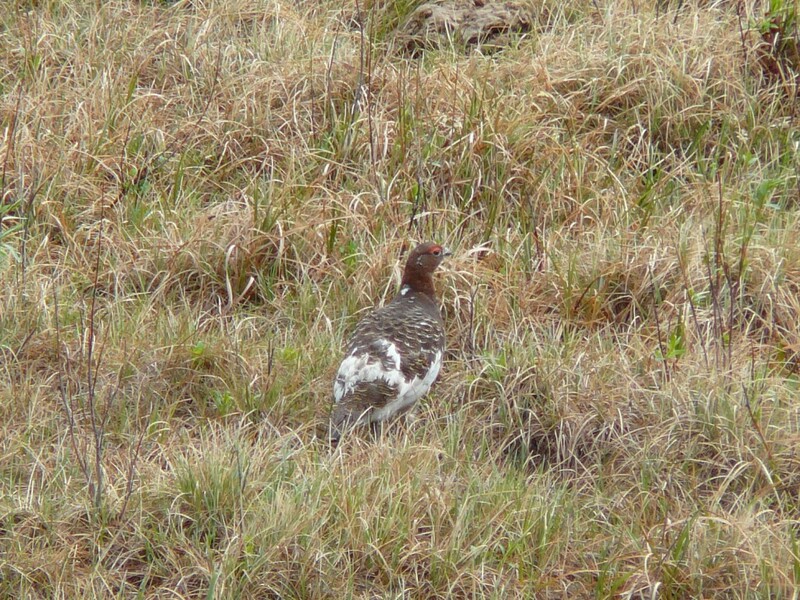 We’ll stop at various spots to marvel at the immense landscape, spot for birds, look out for other wildlife and also observe known breeding locations of the Smith Longspur. We will pass several lakes and hopefully see Read-throated Loons and Tundra Swans. 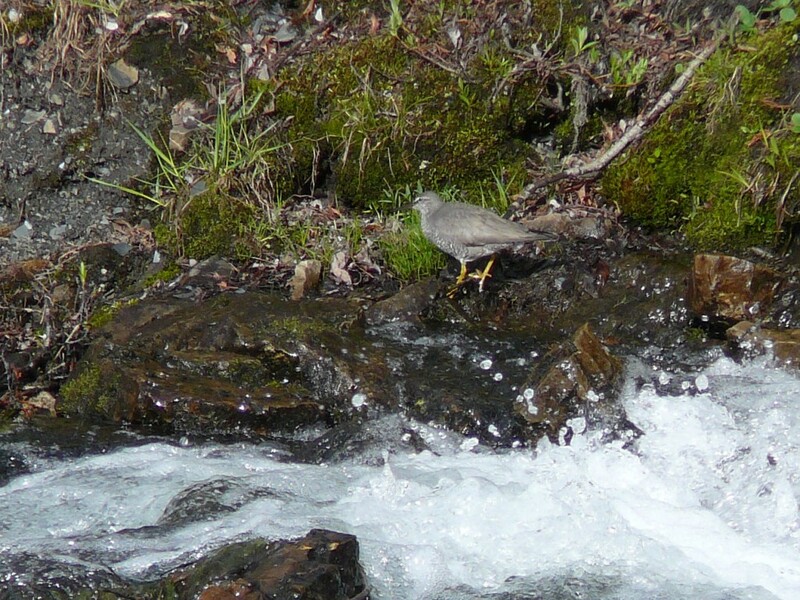 We’ll cross two mountain passes before we reach the cliffs of Engineer Creek with the nesting Gyrfalcons. We spend the night back at Tombstone campground. Day 5: Today’s itinerary will include more hiking into the alpine or we travel farther north on the Dempster Highway to observe wildlife and birds around Northfork Pass and the Blackstone Uplands. Overnight at the campground. Day 6: Early morning stroll to the beaver pond to listen to the morning chorus of the forest birds. We explore more of the area and hike Charcoal Ridge or Goldsides Mountain for more bird watching and from where we enjoy a breathtaking view over Tombstone Park and the Dempster Highway Valley. Later in the day we will leave the Tombstones behind and head towards Dawson City. Overnight at a downtown hotel. Day 7: Dawson City Goldrush Tour and visit of the Midnight Dome with its spectacular 360 degree view. Optional visit to the Dredge #4. In the afternoon we will hit the road again for our return to Whitehorse where we will arrive in the evening. Overnight at a downtown hotel. Day 8: You say goodbye to Whitehorse and continue on your own itinerary. In 1979, the Canadian government built this 800 km (500 miles) gravel highway to open up the oil and gas riches in the Mackenzie Delta. But the real riches are in the unsurpassed views, overwhelming beauty and magnitude of the landscapes. There are no communities and no accomodation along the stretch of the Dempster Highway we are travelling for this trip (km 1 to 270).